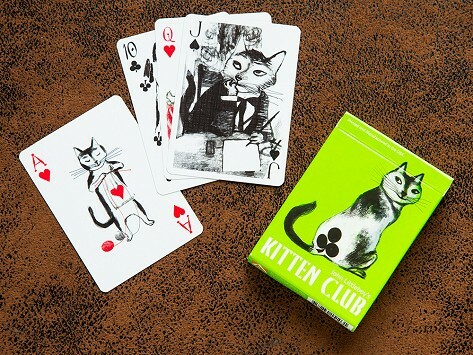 These playing cards are infused with charm and humor courtesy of original illustrations depicting sweet-faced cats. A story unfolds through each ace through 10 suit of cards telling an engaging, kitty-centric story, while the face cards star cats dressed up as a geisha, flamenco dancer, and other colorful characters. Dimensions: 3.5" x 2.5" x 0.75"
I gave a set to my cousin who loved them. They are really nice. I am a cat lover and just love these cards - so cute and different! fun cards for cat lovers! The drawings on these cards are imaginative and well done! The deck was a gift for my 14 year old grandson and he loves them! Artiphany playing cards aren’t like a typical deck, which is exactly why we are so delighted by them. These cards are filled with humor and personality, courtesy of artist and founder John Littleboy’s original illustrations. John has captured the playful, coy, and mischievous nature of cats and dogs in a way that infuses the deck with charm. Each ace through ten suit of cards tells a story that is so fun to see unfold, you might forget about the hand you’re playing. The cat-centric Kitten Club deck stars a feline geisha, flamenco dancer and more colorful characters as the face cards, while a puppy pirate, troubadour, and king (of course) do the honors in the Pack of Dogs deck. While you certainly don’t have to be a pet lover to appreciate these playing cards, a deck makes a great gift for a dog- or cat-person—or anyone who appreciates something truly original.